A video has circulated online showing a Newcastle United fan confronting managing director Lee Charnley - sparking a huge social media reaction. The unnamed fan, whose Twitter handle is @for_supporters, captured his encounter with Charnley last night, questioning the Toon chief as to whether Mike Ashley gains free advertising from the club. The fan followed Charnley for one minute 40 seconds and also questioned his role and made reference to his salary. 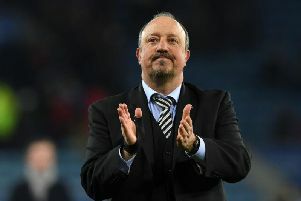 However, the video has brought mixed reaction with some fans welcoming Charnley being challenged while others expressed reservations with the confrontation. @ketchell: "They make supporters lives difficult so shouldn’t be surprised when it happens the other way". @danny5590: "Well done for doing that! Taking time out of your evening, this should happen to him way more often. This is the 1st time i have seen a fan question him on video". @shawt1974: "Well done that man the silence says it all." @psad2: "This is superb. Pressure like this needs to be applied to Charnley. He is the puppet and the weak link in all of this." @JoolioGeordio: "Well done. Silence speaks volumes. Also displayed some arrogance and ignorance. Charnley could have shown some common decency at the beginning of that exchange to acknowledge the question rather than running. @JarnyBen: "I thought that was a really calm, sensible, non-threatening approach. Can understand why Lee didn't answer, but it's a good start". @andy_emmers: "Do we have a right to stalk them at night?" @PJ_Ents2308: "I met Lee a few years ago and he was a nice bloke, a scapegoat for Ashley and although not aggressive at all, waiting in the dark for someone is a tad weird. More than 52,000 have had enough though - me included." @Pjm5370: "Bit scary and creepy that like." @Iam_Wry 13m13: "This was the wrong question. Ashley owns the club, he can advertise what he wants surely?"